Denver, CO: On Tuesday, November 6, 2018, thirteen Colorado hospitality organizations joined forces for the 25th Annual Serving Up Hope Luncheon and raised $24,000+ for Food Bank of the Rockies’ Denver’s Table program. A total of 710 industry professionals from around the state were registered. Serving Up Hope is sponsored by the Meetings Industry Council (MIC) of Colorado (www.mic-colorado.org). MIC is a coalition of professional meetings industry-related organizations. Incorporated in 2000, MIC is a partnership between 13 national and local member organizations either founded in Colorado or within state chapters. Its underlying purpose is to enhance collaboration among participating organizations through networking and education, while being the main source for industry knowledge and consultation as well as foster the continued growth of the meetings and event industry in Colorado. 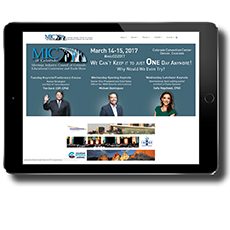 MIC also introduced a brand new, redesigned website to the attendees, greatly enhancing the site’s appearance and communication for all member organizations! Chefs from local hotels and restaurants provided mouthwatering appetizers, exquisite entrées and delectable desserts. Judges included Chef David L. Beckwith, Professor, Metropolitan State University of Denver, Chef Jenna Johanson, Innovation Chef, and Paul Fischer, Food Bank of the Rockies Chef. The judges awarded prizes in three categories (Appetizer/Salad, Entrée, and Dessert) to the best entries among the (15) food stations. Culinary awards were given to Punch Bowl Social for Best Appetizer with their Pork Pate ; the Renaissance Denver Stapleton Hotel (Fifty 300) for Best Entrée with their Scallops; Lucky Strike for Best Dessert with their Toffee Bread Pudding; and The People’s Choice award as voted on by the attendees went to the 2016 award winner, Renaissance Denver Stapleton Hotel (Fifty 300) for Scallops. Winners received an award tile with artwork designed by Andrea Chavez. Andrea is a member of the Food Bank of the Rockies Kids’ Cafe. Event Chair Carol Lathrop, IMES Events, Event Vice Chair Aimee Palifroni, Prisma Events and Todd Seymour, MIC Chair, presented awards to all recipients, along with a check for $24,000 to Food Bank of the Rockies President and Interim CEO, Michelle Barnes. The special Serving Up Hope committee is a group of dedicated and compassionate individuals from the hospitality industry who work together to create a wonderful event with delicious food and fun for a great cause. Nearly everything is donated and 100% of the proceeds benefit Food Bank of the Rockies and its Denver’s Table program. An additional element of the Serving Up Hope event is the annual food drive competition between the thirteen MIC organizations. This year, over 14,692 meals were donated day-of by attendees, in addition to the $24,000 raised by the luncheon, contributing to an overall total of 114,210 meals. 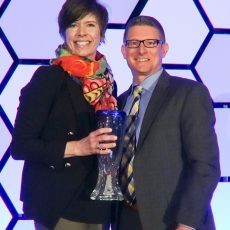 Awards for the most food donated per member were given to two organizations – Christian Meetings & Conventions Association (CMCA) for the organization with less than 125 members and Colorado Society of Association Executives (CSAE) for the organization with more than 125 members. Food Bank of the Rockies (FBR), a non-profit organization, distributed 41.3 million pounds of food last year through their direct service programs and partner agencies, serving clients in Northern Colorado, including Metro Denver, and the entire state of Wyoming. 1 in 7 Coloradans, including 1 in 4 Colorado children, struggle with hunger. Since 1978, FBR has provided more than 472 million pounds of food to our community that translates to nearly 367 million meals for people in need. For more information about Serving Up Hope or MIC, please contact Kelly Kucera, Director at Large, Communications at kelly.kucera@root-productions.com. This event would not be possible without the efforts of all of our Sponsors. Please visit them here and Buy MIC!